Death By Audio Echo Dream 2 Review – Best Lo-Fi Delay Pedal? The Echo Dream 2 is an update to one of Death By Audio’s most popular pedals: the original Echo Dream. It’s a lo-fi delay pedal with “Advanced Echo Modulation” courtesy of it’s built-in LFO and a preamp fuzz circuit. The Echo Dream builds upon its predecessor with control knobs for Fuzz and Master Volume and is significantly less expensive than the original. If lo-fi delay with modulation is your thing, this may be just the pedal for you. Is it the best lo-fi delay pedal out there? I’ll help you decide for yourself in our Death By Audio Echo Dream 2 review. Control knobs for Echo Delay Time, Echo Feedback, Master Volume, Fuzz Level, Delay Volume, Modulator Speed, and Modulator Depth. Flip switch for 50/50 Wet/Dry blend and Dry Signal Off. Flip switch for Sine/Square Mod Shape. Delay time ranges from 20ms to 1.2 seconds. Feedback control allows self-oscillating modulation. Powered by 9-volt battery or 9-18VDC Adapter. Visit Death By Audio for more info about the Echo Dream 2. I started off playing this pedal through a simple clean amp channel. With the Feedback, Modulation, and Fuzz rolled off I activated the Echo Dream 2 with a Delay Time around 200ms and was treated to a gentle slap back delay sound. You’ll notice right away that the Echo Dream 2 has a warm, ethereal sound that practically begs you to start creating some dreamy soundscapes. With the Master and Delay level controls it’s easy to find the perfect signal level and put the delay trails where you want them in the mix. Pushing up the Feedback brings in some ambience as expected and creates a cascade of delay trails. Pushing the Feedback around 2 o’clock causes the pedal to self-oscillate, creating waves of noise. Tweakaholics will get their fix just by adjusting the Delay Time and Feedback to their heart’s content while the pedal self-oscillates or feeding the Echo Dream 2 audio signals and mangling them accordingly. There’s plenty of opportunity for sampling the Echo Dream 2 by itself or with any audio source you can plug into it. You can bring in some gentle modulation to your delay sound with a subtle turn of the Depth knob. With the Sine wave enabled and slow Speed settings, you’ll achieve a smooth modulation that adds a hint of movement to the ethereal echos. The Echo Dream 2 produces a beautiful modulated delay sound, the kind that skillful sonic experimentalists can use to mesmerize audiences. The Square wave produces a more rhythmic pulse. When synced with the delay time, you can achieve some driving delay sounds that churn with the rhythm. The Echo Dream 2 can produce a variety of modulation from subtle to extreme with its two available wave shapes. You can also roll back the delay controls and use the modulation on its own for some chorus-like effects. The Fuzz knob option is welcome addition of the Echo Dream 2, fitting since Death By Audio have become famous for producing such great fuzz pedals as the Apocalypse and Thee Ffuzz Warr Overload. At lower settings in the neighborhood of 9 o’clock, you’ll achieve a warm boost that overdrives your delay tone nicely. You really must hear the warmth of the Echo Dream 2 firsthand as it has the kind of sound and feel that may inspire you create entire songs, maybe whole albums. Pushing the Fuzz to noon and beyond brings in a quality fuzz tone that is pure Death By Audio. More than just a tacked on feature, the Fuzz sounds excellent and can be used on its own with the Master control. Just roll down the other controls and you’ve got a great sounding 2-knob fuzz. All in all there’s much more to the Echo Dream 2 than most other guitar pedals offer. Death By Audio took a great pedal with the Echo Dream and made it even better. Let’s see the end result. 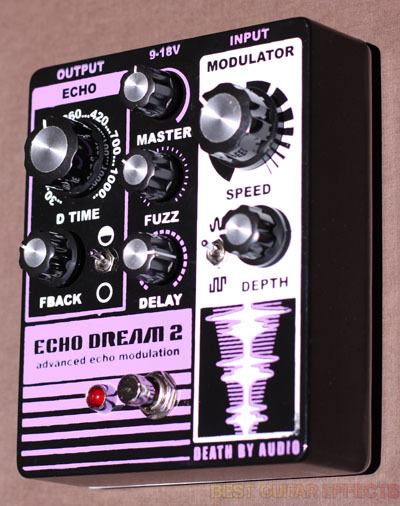 The Death By Audio Echo Dream 2 offers superb lo-fi delay sounds with plenty of additional functionality. You can even use the modulation and fuzz sounds with the delay or on their own, making the Echo Dream 2 much more versatile than many other delay pedals. The character of this pedal is rich enough that you may even base your entire sound around its nuances. 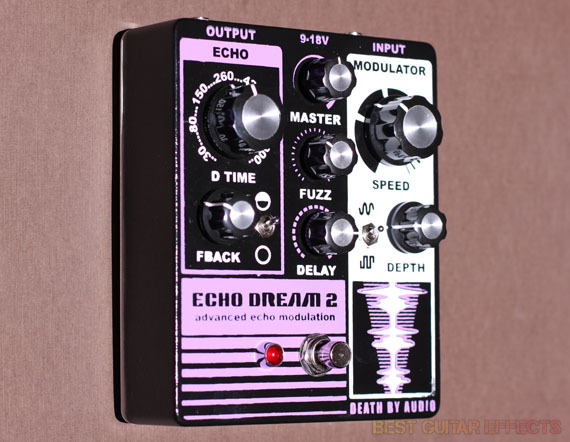 If you’re in the market for the best lo-fi delay pedal you can buy, you must try the Death By Audio Echo Dream 2. That concludes our Death By Audio Echo Dream 2 review. Thanks for reading. 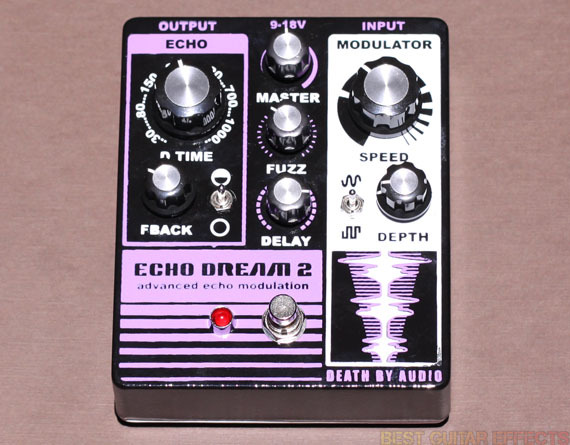 Want to buy the Death By Audio Echo Dream 2? Did you enjoy our Death By Audio Echo Dream 2 Review? Check out our top delay pedals buyer’s guide. Again….no expression input, no loop function, and no reverse? Loop and Reverse absolutely, but an Exp. jack shouldn’t be that big of a deal to include on a $300-$400 analog delay. It’s a mod someone can do at home for about $10 if they have a drill, soldering iron, and a basic grasp of required impedance when purchasing a jack to install. I think it should be basic hardware on a pedal in this class. $200 or less gets you an exp. jack with Moog MF Delay or Boss DM2W, and Moog’s is assignable between time and feedback. Fairfield Circuitry’s Meet Maude, which is more in the class of the Echo Dream 2 also offers exp jack which is assignable to any knob on the pedal, if I’m understanding correctly. DBA should have slapped one on these for the price.